This is an extremely helpful and easy-to-use parallel text harmony of the Gospels. It includes a main story line in bold type allowing you the freedom to consider and compare the story variations without losing the Gospel continuity. 224 pages, from Baker. 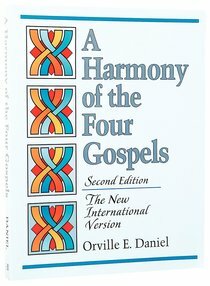 About "Harmony of the Four Gospels (Niv 2nd Ed)"
An easy-to-use harmony of the four Gospels, featuring one main story line in bold type. One of the easiest-to-use parallel text harmonies of the Gospels looks more inviting. Improved type design aids readability of the four parallel columns. Boldface type sets out a unified narrative. One of the easiest-to-use parallel text harmonies of the Gospels now has an easier-to-read four-column type design.